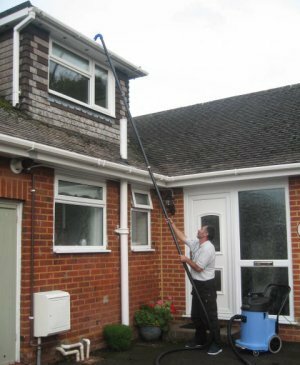 High reach poles together with purified water are used to carry out the cleaning of all high level windows and frames - click here to see how our system works. 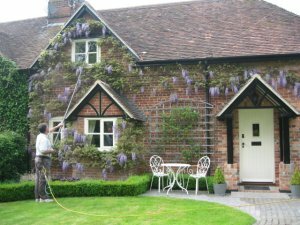 There will always be a need for the traditional method of window cleaning to be used, mainly for the cleaning of interior windows, which limits the use of water and reduces the risk of damage to office equipment. We are highly experienced over the past 25 years in the technique of using an applicator and squeegee and work in the most efficient manner to avoid as little disruption as possible to staff. We also make use of the new micro fibre polishing clothes for much of our internal work to minimize the risk of water damage to internal decorations, electrics etc. 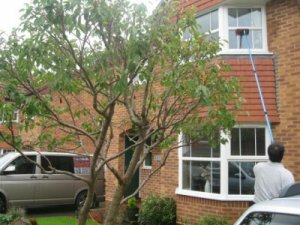 Clarity Window Cleaning also cleans soffits, fascias and guttering. 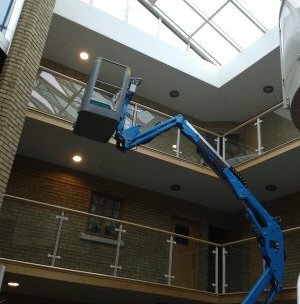 Our window cleaning contracts can be tailored to include the cleaning of other parts of your building to maintain it's appearance such as glass canopies and roofs, display boards and signage, blind panels and cladding, railings and hand rails, CCTV and alarm boxes. Our high powered Numatic vacuum is built for clearing gutters and down pipes, together with the carbon fibre tubing we can reach upto 40' whilst being compliant with Health and Safety Regulations. To keep your building looking at its best we offer a full exterior cladding cleaning service. Cladding which is found on some office blocks and factories, will soon become unsightly with grime and mould, particularly if buildings are close to the sea or roads. 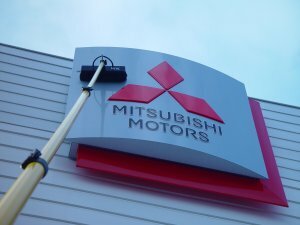 We are able to clean signs of all descriptions from shop fronts to factory signs etc. Clear roofs are designed to let maximum light in, however they become dirty very quickly and before you know it you could be losing up to 60% of your natural light. You will only fully appreciate this once you have it cleaned! Typical cleans we undertake include glass atriums, and conservatory roofs etc. Despite being able to reach to a height of 60-feet the design and accessibility of some commercial buildings it may be necessary to use a hydraulic platform. Our staff are fully trained and all work will be carried out to the highest health and safety standards with the necessary Risk Assessments put in place before any work commences.